This award-winning activity station has a one-of-a-kind seat that allows baby to safely walk or run around the outside perimeter of the activity table! It's like a walker and entertainer in one! Bright Starts 3-in-1 Around We Go! Activity Center in Zippity Zoo fashion will keep your baby entertained and challenged all the way through the toddler years! 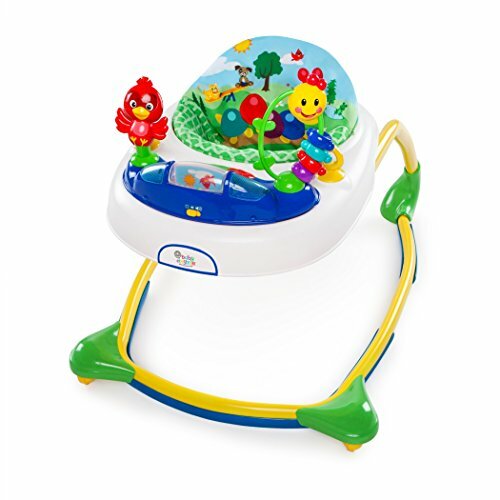 15+ activities include an electronic toy station with volume control and 3 modes of play: melodies, animals sounds and piano notes, plus a flip book with colorful characters and sounds, popping penguins, spinning ball beads, an elephant popper with spinning beads, a teethable palm tree and lots more! Parents have loved this award-winning toy and you'll be glad you chose it for your little one. Take a Step Toward Learning!We know that early learning comes in baby steps. That's why our Push-n-Play Learning Walker provides enrichment to toddlers during every stage of learning to walk! There are plenty of fun activities for youngsters who can sit up on their own, new walkers are provided vital support and stability for shaky steps, and full-fledged toddlers can pack up their toys in the included pocket, then zoom around practically anywhere!Cut from solid wood and finished with safe, water-based paint, our Push-n-Play Learning Walker develops dexterity and both fine and gross motor skills. 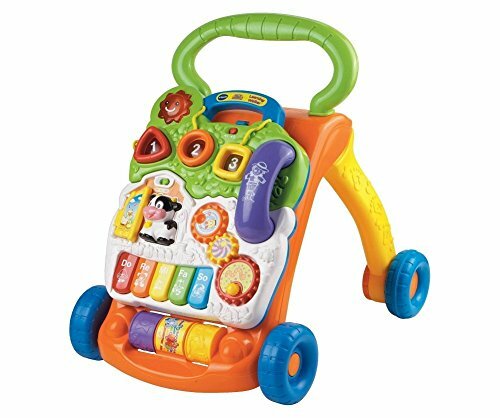 It encourages exploration and discovery with every step.Why You'll Love It:No other learning walkers pack this much learning into one toy! Count on the abacus, jam on the xylophone, or drive the cars through the maze. Crank the spinning gears, go for a stroll, or spin and match the vehicles. Guide the beads along the rail, learn and sort the shapes, pound the ball drum, or make silly faces in the mirror. Your child can bring their favorite stuffed animals, toys, and blankets along for the ride with a handy storage space pocket. Ford and Bright Starts bring families together to put the power into playtime. 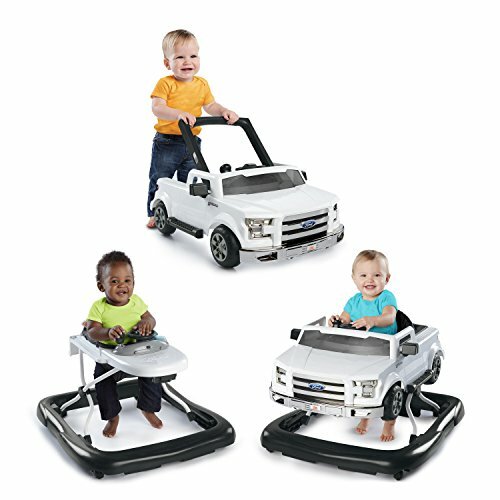 The 3 Ways to Play Walker - Ford F-150 is Built Ford Tough to handle baby's steps at almost any stage. This amazing 3 in 1 walker for baby supports both beginning and more experienced walkers. Two can play at once. 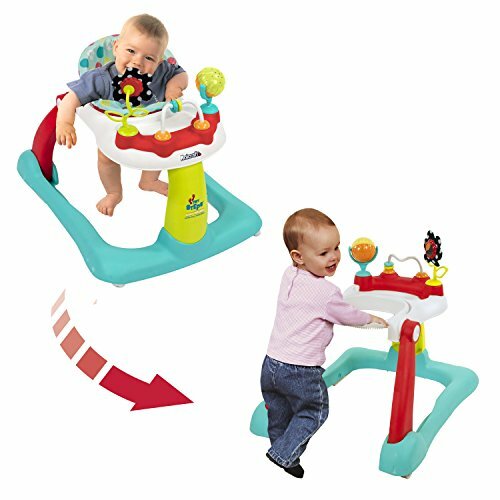 One baby can play in normal walker mode to encourage gross motor skills and more advanced walkers can use the push-behind mode. To use in push-behind mode, simply lift the push bar and remove the truck from the walker base. Baby will "steer" right into imaginative play with the authentic truck sounds, lights, gear shifter, steering wheel and the look of this rugged Ford-tough walker. The removable steering wheel play station can be used for floor play or on the go. A high seat back provides comfort and support for baby. The design of this baby walker allows for easy fold, storage and portability. The walker can be easily kept clean by wiping it down where needed and tossing the seat cushion into the washing machine. It is safety enhanced with rubber feet that "brake" and a sturdy frame. Make the fun last even longer by adjusting the walker frame to three different height positions to keep little toes at the perfect height. 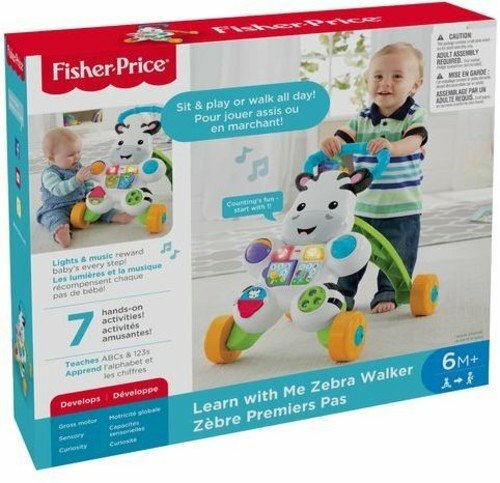 From teaching first words to encouraging first steps, the Fisher-Price Learn with Me Zebra walker is the kind of first friend you want for your little one! Spin, flip, roll, click, twist. This zebra's full of busy, hands-on activities for sitting babies. Your tot can turn the book page or press the light-up buttons to learn all about ABC's & 123's through sing-along songs and phrases with new animal friends! And when baby's learning to walk, the easy-grasp handle and sturdy 4-wheel base help steady those wobbly first steps. "Keep going!" Lots of fun phrases, music & songs invite and reward even more moving & grooving - helping little ones get even steadier on their feet! (And letting moms breathe easier.). Inspired by Eric Carle's best selling book, The Very Hungry Caterpillar™, our walker will take your child on an adventure of discovery and exploration. 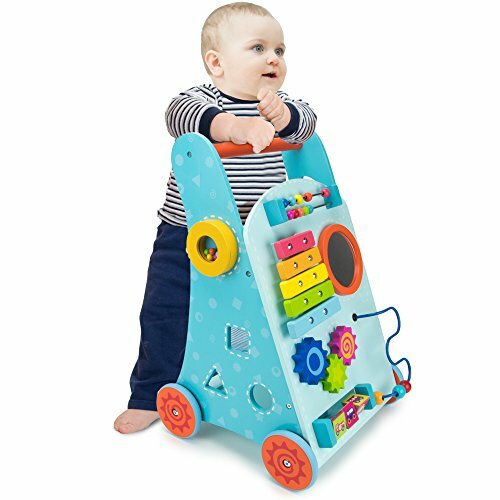 Multiple sensory toys engage your child's curiosity while encouraging motor development as they move around.This 2 in 1 baby walker features 6+ fun toys on the removable tray. Your baby will enjoy the walker and once they get a little bigger, use the bar feature to walk behind safely. The soft cushion seat is an added feature for great comfort during play. Fold-able X-frame structure is convenient for storage and travel. 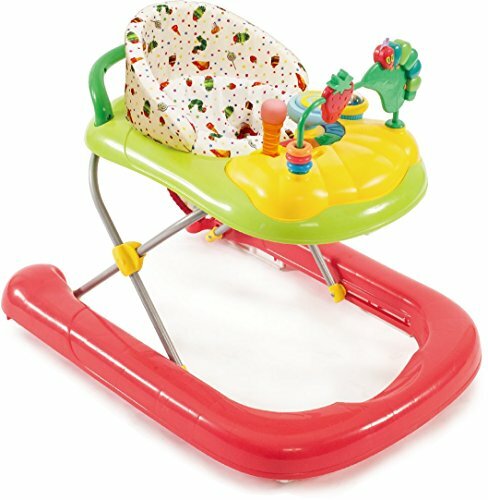 The tiny steps 2-in-1 activity walker converts from a seated walker to a walk behind walker as baby grows. The play tray provides toys for developmental activities and endless enjoyment from infancy through toddlerhood. Toys include upright flower mirror with crinkle petals and textured stem, spinning balls for batting play and bead bar for motor skill development. Independent front wheels can be set to swivel or locked. Plush seat provides high back for comfort and support. Seat is height adjustable to grow with your baby. Walker folds flat for storage and travel. Machine washable easy clean seat pad. JPMA certified. Age range - 6 to 12 months. 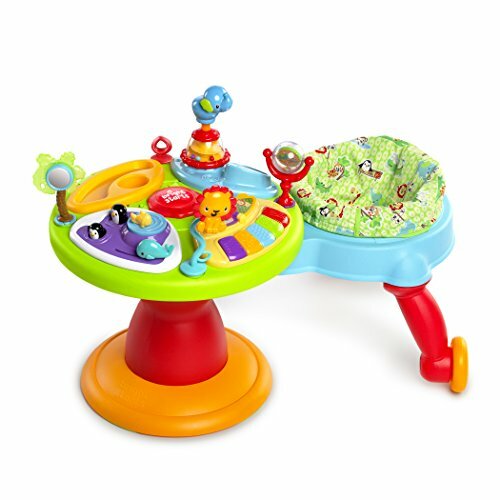 The Disney baby Winnie the pooh music & lights walker offers plenty of fun for your little one. Sturdy wheels work well on floors and carpet alike, while the grip strips reduce walker movement on uneven surfaces. The oversized play tray features the Disney characters your child loves so well and conveniently swings open to reveal a snack tray perfect for little treats or other toys. With a machine-washable padded seat, cleaning the walker is as easy as a-b-c.
Brighten your baby’s day with the Baby Einstein Caterpillar and Friends Discovery Walker. 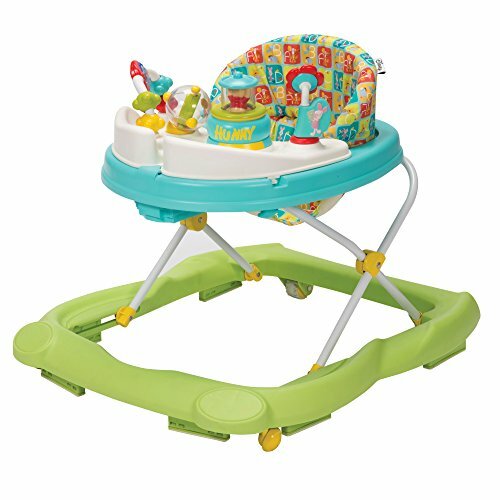 Before your baby takes their first steps, the walker’s unique elliptical frame provides a sturdier platform to explore the world on two feet. Your baby will love the freedom to follow their sense of adventure, and their favorite toys are along for the ride. Discover classical melodies, play with the bead chaser and squeaker toys, and activate lights and sounds with numbered piano keys. As your baby grows, the activity center can be removed for fun floor play. 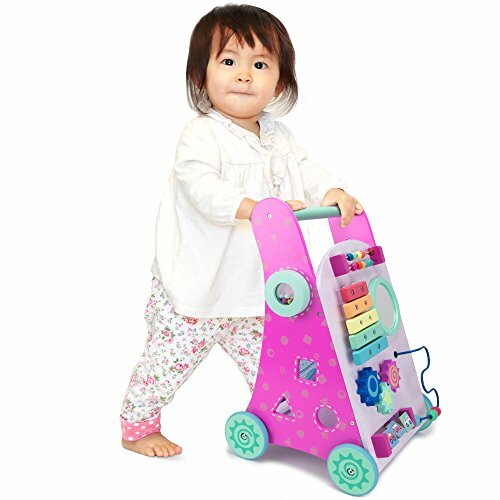 Compare prices on Play Walker at ShopPlanetUp.com – use promo codes and coupons for best offers and deals. We work hard to get you amazing deals and collect all available offers online and represent it in one place for the customers. Now our visitors can leverage benefits of big brands and heavy discounts available for that day and for famous brands.